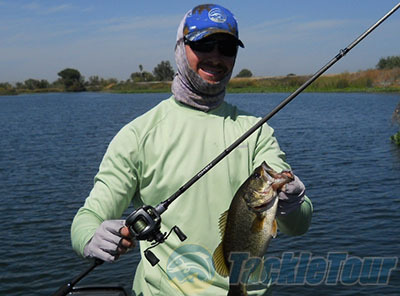 Introduction: Shopping for a new Bass rod sure has become interesting the last several years. Never before has there been such a broad spectrum of rods on the market, both from fresh companies as well as old familiars introducing new technologies and designs. In particular, the competition among affordable to mid priced offerings has never been so fierce. Many of these sticks are good, but for me none of these really hit a true home run with the overall packaging. At ICAST 2012 in Orlando there was a newcomer to the scene named 13 Fishing. While en route to various appointments and meetings at the show, I really caught nothing more than a brief glimpse of their booth and honestly wasn't even keen to exactly what they were exhibiting. It wasn't until after ICAST I was online browsing through the plethora of ICAST videos when I happened upon theirs. In it they highlighted their Bass rod lines, the value priced Omen series and mid priced Envy series. 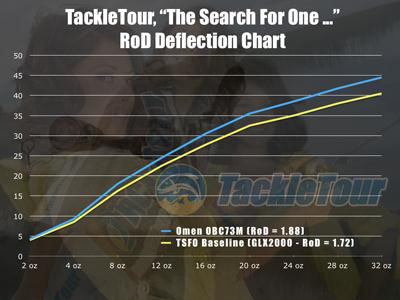 With my interest piqued, I contacted Zander about testing one and he purchased an Omen OBC73M from Tackle Warehouse and sent it to me within a couple of weeks. Since I was vacationing in California, Cal dropped the rod off at Hi's Tackle Box in South San Francisco where they were gracious enough to hold the rod for me to pickup. After partially overcoming jet lag, I met Michelle at the shop and grabbed the Omen to begin the testing process. Suffice to say it was a tag team effort to bring this rod in for review. The rod specs and even the graphite tonnage �J-30T� is listed. 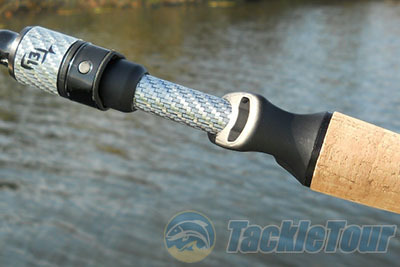 Impressions: What I like best about the look of this rod is it's overall simplicity. The matte gray blank is adorned with 11 Evolve Titanium framed Y-Guides featuring Zirconia inserts. The first 2 guides are double footed, while the rest leading to the tip top are single foot. Securing them to the blank are gloss black wraps. The guides not only look good and are sized right, but they seem to be of excellent quality, with no visible imperfections noted.. Same goes for the wraps as well. They are clean, with no drips or sloppiness. Guides are clean and sized correctly so as to not overpower the blank. 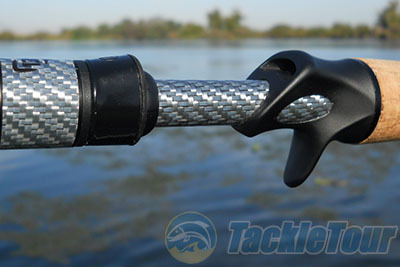 The most standout feature of the handle area is the reel seat and trigger design. The reel seat and locking ring are a silver graphite weave that looks futuristic and tasteful. Speaking of the locking ring and reel hood, it twists with relative ease but could be a bit smoother. The ring surface is also very smooth to the touch, and it can be a tad tough to grip when locking or unlocking a reel, especially with slippery hands. Custom designed �hair trigger� reel seats offer increased blank contact. The reel seat is designed for maximum contact with the blank. The blank is fully exposed underneath the reel, and the custom �hair trigger� design provides cutouts on each side of the trigger for added finger contact. This seemed gimmicky and possibly uncomfortable to me at first, but that couldn't be further from the truth. It is extremely comfortable and transmits sensations very well. In fact, the relatively thin cork handle combined with the added blank exposure of the reel seat makes the rod feel narrower and more precise in hand. Looking at the reel seat from the top, you can see how the trigger portion tapers inward where the cutouts are located. This adds to the overall comfort and gives your fingers a natural place to settle in. In hand, the Omen feels great. It doesn't have extraordinary lightness, but it is well balanced which gives it a light overall sensation when fishing. The cork and foam combined with the silver weave accents of the reel seat makes for an upscale jdm style look. Personally, I'd prefer full foam grips but that's just me. The Omen is extremely comfortable to hold. The silver reel seat ring does a great job of covering exposed threads. I favor this design over any type of foregrip addition. Lab Tests: Taking a look at our deflection data, you'll see that the Omen starts out inline with our MBR783C GLX baseline rod, but exhibits softer qualities when the weight really starts to add on. Even though the Omen OBC73M measures out to be softer, in my eyes it remains very true to its medium power rating, as well as it's line and lure ratings. Also keep in mind the MBR783C is also 9 inches shorter, and is a medium heavy rod rated for a bit heavier lures. Balance of the Omen is also noticeably better than our average. With a reel attached, feel in hand is excellent. 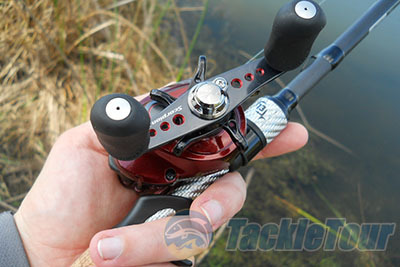 For example, with a 6.7 ounce Shimano Scorpion 1000XT aboard, the balancing point is right at the winding check. Real World Test: I had a unique opportunity to test the Omen both in California, as well as here at home in Florida. The California Delta and San Francisco Bay were fished out west, while the normal variety of lakes and ponds were tackled at home. 14lb mono as well as 20lb braid were the lines of choice. A chunky Senko fish from the California Delta.